At Andrade's, we specialize in offering fine dining at affordable prices. We cater to special parties with our outside dining and bar area. 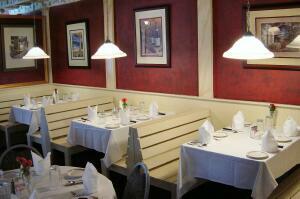 We can also seat up to 150 people in our inside dining area. Our friendly atmosphere is something you must experience and enjoy. Our Latin-American cuisine is unique to this area. No where else in this area will you experience this type or style of fine dining. Rigoberto Prarda, the restaurants owner and founder explains the difference in his Latin-American cuisine in this way, "There is a large difference between Mexican and Bolivian or Peruvian and Spanish cooking. Here at Andrades we offer a blend of Latin American and Spanish cuisines that you more that likely will not find anywhere else in Central Virginia." We are located in the heart of Old Towne Petersburg which is rapidly undergoing a transformation into a popular destination spot with art galleries, antique stores, shops and restaurants. The building that houses our restaurant is a restored 1820s type structure that endured the almost 10 month long Siege of Petersburg during the Civil War. Our building was struck by Union Army Artillery fire on several occasions. We serve the Tri-City area which includes Petersburg, Colonial Heights, and Hopewell. Including the surrounding Counties and towns of Chesterfield, Dinwiddie, Prince George, Ft. Lee, and Richmond, Virginia. 11: a.m. - 10:30 p.m.
Sunday Brunch: 11: a.m. - 3 p.m.
We Cater to Small or Large Parties at your Home or Business.